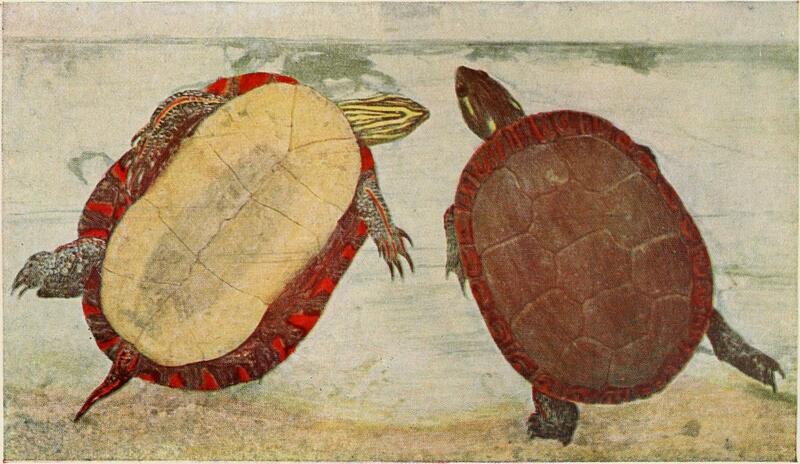 Western Painted Turtle. Internet Archive Book Image, Courtesy Flickr Commons. Blogging is a bad platform for the slow and reflective. Which is how I tend to approach my writing, particularly those pieces which fall into the category of family memoir. This is especially the case when life changes more drastically, or has more ups and down, than I can easily process. Take my father’s health, for example. The last post I did relative to that roller coaster was in late November. Yet at the time I was chronicling things that had happened in July. Half a year ago now. This was when my dad decided to fire all but two of the personal care assistants that had been coming 24/7 to take care of him and my mother since his first hospitalization in May, and his second in June. I left things there, which confused many caring people. I do not apparently have the equipment to be a good journalist. For this I apologize. 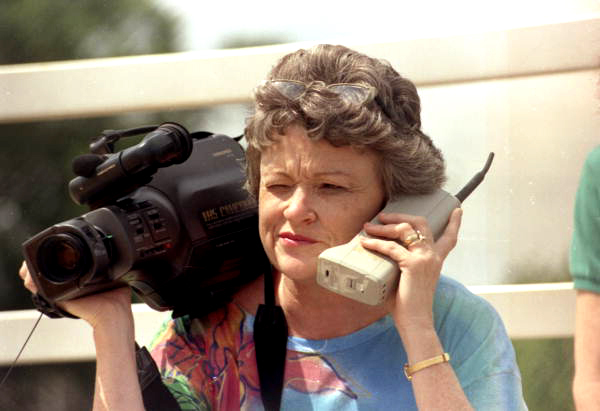 Pulitzer-Prize winning investigative journalist Lucy Morgan, 1985. Courtesy Flickr Commons. My father had a third hospitalization, for pneumonia last August. The first hospitalization was just after Mother’s Day. The second was on Father’s Day weekend. The third was on my parents’ sixty-first wedding anniversary. Apparently even the “good” stress of looking forward to something is a health risk for my father these days. Now someone is assisting at my parents’ home from nine to one and from five to nine, each day, which at the moment seems to be the right balance of assistance and independence, for my parents as well as for my sister Whitney, who lives twenty minutes away and has had the bulk of the responsibility for caregiving. There was a fourth hospitalization in October. This came after a CT scan to make sure my father’s lungs were clear from pneumonia accidentally went a bit low, revealing a dark spot on his abdomen. The dark spot turned out to be an aortic aneurysm. Apparently many older people develop these. While not as dangerous as a brain aneurysm, a rupture is still bad news, and the doctor recommended a stint be implanted. That surgery went reasonably well, but it was by no means easy; the anesthesia caused vomiting, and the initial recovery period was painful. Most upsetting to my father was the catheter he came home with. His bladder had descended during surgery, causing urine retention, a complication we had been unaware of as a possibility. Urine retention, which has other causes in men as well (weakened muscles, nerve damage, enlarged prostate), can damage both bladder and kidneys. Since my dad already has chronic kidney disease, this is a serious problem. That complications could occur we knew. But the older you get, the more there are, and the specifics are often blurry. So the catheter had been put in until things got back to normal. Since that time it has been out, and then back in, and then out, and now it is back in again. My father’s anger, his bitterness and resentments, have always been difficult for me to experience. But his disappointment and despair – even secondhand, through my sister’s reports – takes difficult to new depths. Over and over he is forced to confront not only the fact that he can no longer take care for my mother, but he can no longer take care of himself. His body is just wearing out. Meanwhile, despite her Alzheimer’s, my mother appears healthy as a horse. “You are improving, while I am declining,” he said to her one day. The tone was tender, with a side of wise-assery. 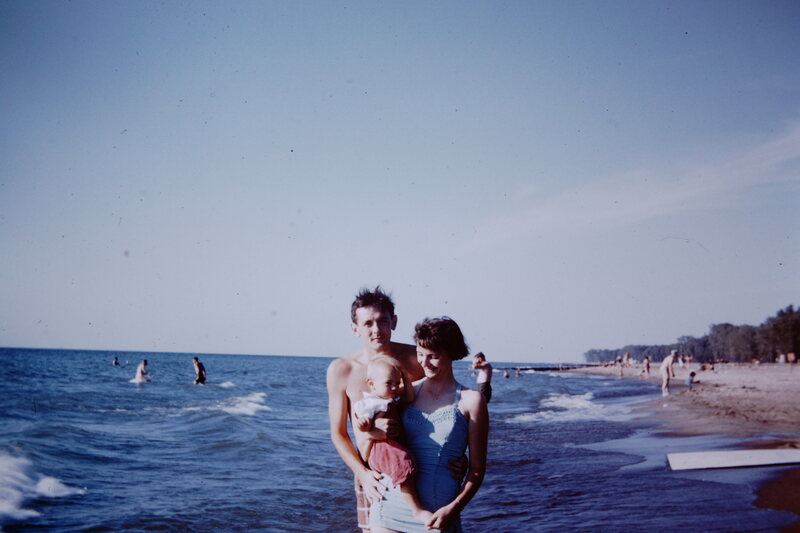 My parents in younger days , with a little me. Of course there are always options. The problem is determining which ones are good ones. “What’s the chance of that?” my sister asked. Maybe 50/50, she was told. If it’s not just weakened muscles. Or nerve damage. Surgery involves more anesthesia, and another two to three day hospital stay. And arranging 24 hour care for my mom. If, that is, his doctor gives her OK, and there are no complications in the pre-op physical. The day before the stent surgery, for example, after everything had been cleared, a boil that might become inflected suddenly appeared. All the aides had to be cancelled, and then rescheduled. My sister’s job, of course. Dad’s all gung ho for surgery. As far as he’s concerned, the worst that could happen is that it wouldn’t work. Which he says he understands is a possibility. But doctors fix things. That’s their job. My sister is not thrilled. But there’s more to her lack of enthusiasm than the upcoming hassle she faces. She is afraid he is downplaying the possibility of complications. So am I. Still, what can we give him now but the dignity of choice, the power to make his own decisions. In the meantime I am not blogging regularly. For more reasons than my father’s health. Reasons related to work, and self-care, family and relationships. Not to mention the health and wellbeing of my country. Because everything I value about living in a constitutional democracy with a bill of rights and an evolving understanding of what those rights mean – for all people – is being threatened by the narcissistic demagogue I am now ashamed to call my President. The forces that put Donald Trump in the White House may not be new. But I refuse to accept them as normal. There are things that need to be done. Even for the slow and reflective. 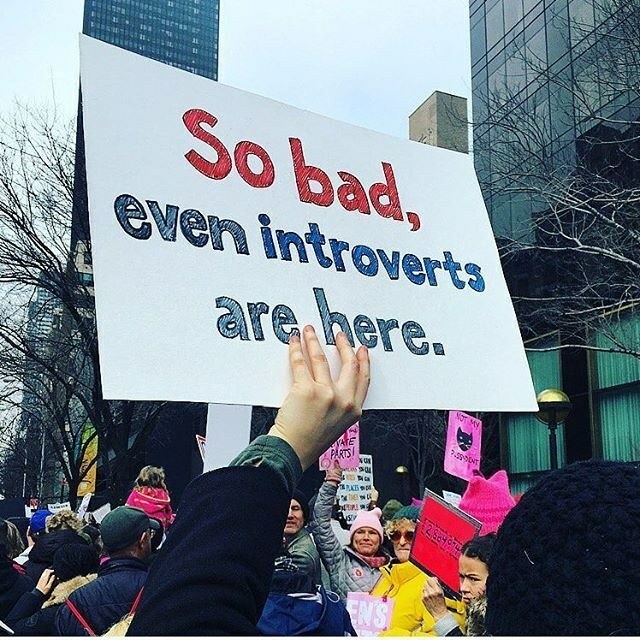 Courtesy Teen Vogue, which has 40 other great signs from the Women’s March. So sorry to hear about the health issues. It’s never easy, especially when it’s your folks, and you’re not as near as you’d like to be. We went through that years ago with my MIL. Be well, and take care of yourself. Best to your sister as well. I wish you great wisdom in these times, Paula. There are many times I am grateful to not be in the USA. This is one of them. It’s the first time that I’ve wished I wasn’t so close, though. My mom was offered surgery a few years ago for a potentially scary condition — and everyone, including us siblings, the doctors, and Mom all said “no” to it. Mom underwent tests a couple of days ago to determine if the condition has worsened — in which case her already-limited mobility may prove to be on a downward curve. These normals — which are not at all normal — can be tough. Those care hours for your parents sound really good ones. May you, your sister, and your parents all do as well as you can within your new normal. Post when you can and wish — but don’t feel pressured. You can only do what you can do. Thank you, Diane, for your kindness. And for keeping your borders open. Tough times and I can understand your need to process them in private before you blog about them. Wishing you a lot of strength to get through this all. Good wishes are always appreciated. And they do add strength. Thank you, Marina. Oh, how I have missed you! I am so sorry for all the personal challenges you are facing and yes, the shame we are now experiencing because of the actions of this horrible, horrible man. We will stand together to defeat him, of that I am sure. Sending you much love. Thank you, Kara. I’ve missed you too – and needed that gratitude post. A bucket of scheisse, indeed. Thanks for the diamond ring. That sounds so hard, Paula. I’ll be thinking of you, and I hope your life will settle down soon. Thank you, Lydia. Good thoughts are always welcome. I’m glad to get your update, Paula, difficult as it is. I’m also glad to see we love the same political sign. The outer world is alarming enough, but the personal disasters don’t stop to take a break. Keeping an aging body going is something I know too well. My mother-in-law turned 101 this week and we have 20 hours of health aid care a day. She finally stopped fighting against her own needs and doesn’t fire people or treat them disrespectfully. Your dad still has a fighting independent spirit that makes caregiving so much harder for everyone. I wonder if I’ll do better when I lose my independence. I was hesitant to put that sign up, since this introvert was not actually there, though I watched the coverage and was heartened by it. I was at a rally to speak out against the Muslim Ban last Tuesday, though, with both my children, and it was an experience I won’t soon forget. So glad you wrote a new post. For some reason, even though I follow you, I haven’t been getting updates, so I followed you AGAIN. Hope it works! My mom declined steadily for over 10 years with Alzheimers, and it wasn’t pretty. To say she was feisty is putting it mildly. But there were many happy memories that went along with the bad–like the day she shook her finger at me and said, “You’re lucky I won’t remember this tomorrow.” I hope you have some happy moments to balance out the difficult ones. I was disappointed about our election, but the Republicans have the majority of everything right now. They can’t blame anyone else if they screw everything up. And I have confidence they will. Thanks, Judi. I’m glad you have some happy memories. In many ways the difference between how my mother is aging and how my father is aging keep presenting themselves to me as choices that are available to me. Which is both true and not true. A good friend of mine had a plaque hanging in her bathroom. It said, “Old age is not for sissies.” I believe her. Truthful post, I hope that the love and light within each day you have takes some of the darkness and hate that seems to be spreading in this world we live. Keep Smiling. Thank you. I am curious – what does your user name mean? Stopped by your blog but found no explanation. It’s a personal number thanks to my grandma the number 3, She was a very bright part of developing my soul. I’m the 3rd child of the 3rd child on each side of my family, so that is why I chose that but it all started with my Grandma. Hope that makes sense. Ah. Like the seventh son of a seventh son. ;-) Perfect sense.